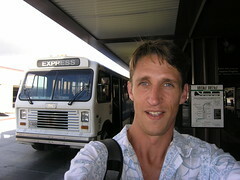 Back from Hawaii, even got to see the Wiki Wiki bus in Honolulu. Rested, but now boarding a plane to Boston for the Gilbane conference. I'm in Hawaii, engaged in Wiki Wiki (cough) research. Light if any posting this week. Give me a couple of days to get back into the conversation. Are you a döt Net? Socialtext developer Terry Brian Ingerson, also known as Ingy, has gone and changed his name. He is now known as Ingy döt Net. Somewhere in the middle of the Google Books debate last night, it confirmed for me that we are in a ping server war. It's a little hard to see, but the ping server will become the new center of the net. Verisign's acquisition of Weblogs.com was the first salvo. I'm not sure Robert Cringley is right about Google-Mart, but he isn't entirely wrong. Google Base isn't just about volunteered structuring of data, but pushing pings (Mark Pincus isn't entirely wrong either, but that's another issue). The important point is there is tremendous value being the first to have information pass through your central node. As an aside, the reason it occured to me in the middle of last night's debate was how part of the copyright argument was shifting from opt-in to opt-out, regardless of the specifics of this case. Google is suggesting that instead of getting permission from copyright holders first, others would contact them to opt-out. The reason this is an issue at all is because there is no registry of rights holders that is kept up to date. Maybe one day there will be a technical solution, and I'd imagine it would look something like an RSS page for each copyright holder that pings a server (or many) when ownership or contact information or license has been modified. In a moment of madness, I considered Google Books to be a marketing ploy for Google Base. Now, a supposed ping war may not matter. Any time a network hubs around a node where the flow is valuable, an arbitrage exists. Central power of a ping server leads to the recognition of alternative servers. If that fails, the spiders start crawling faster. The only drawback is the network becomes inefficiently loaded trying to find even distribution. Such redundancy is a great reason to love the net. They dynamics here hold far less ability for control than the lower levels, we should be aware of them, but more gravely concerned about the concentration below. So I'll apologize for this post. Can't make it groove like Steve Gillmor. Just a musing. Great article in BusinessWeek on how wikis and IM are solving the email problem. Recently, Lennard wanted an analysis of how to double profits on a particular trade. Instead of shooting copies of the same document to several people via an e-mail attachment, only to have to keep track of, merge, and archive all the fixes back into a central version, he threw the problem up on a wiki page where everyone could brainstorm, comment, and edit in real time. In the space of two days, entire e-mail conversations evaporated and Lennard had analytics that would have otherwise taken two weeks. Next year's budget practically wrote itself on the wiki page. Only one problem with the article, no mention of Socialtext. I guess I should be upset at this, but as long as we keep advancing wikis in general and delivering the above to customers, we keep on leading the market. It's time to commend previous the whipping boys of the blogosphere. Two companies that grew a bit too fast, made mistakes and seem to have learned from them. Technorati is fast again. They shared the process throughout, kept at it and I think are winning people back. The common theme is that good communication and sharing the process provides a way for your community to be included in the outcome. Negroponte's team is seeking not only a technological breakthrough but also a teaching breakthrough. They believe that illiterate kids can, with a little instruction, learn to use computers on their own and then use the laptops to teach themselves to read. After that comes math, history—you name it. Alan Kay, a Xerox Parc veteran, is working with MIT mathematician and educational theorist Seymour Papert to build software that "watches" each student and makes suggestions. Papert's "constructionist learning" approach encourages children to reach conclusions through trial and error. This breaks known conventions for education and technology, which could have a far greater impact than the commoditization at play. My favorite Clay Shirky quote is "process is an embedded reaction to prior stupidity." That is, there was an exception to process and an expert designed a way for people to work together in one context that should fit all prior contexts. The problem is, the process becomes calcified and accepted as the rule. After all, it's a rule, and in corporations we follow them, even if it fails us or simply doesn't make sense. Because of constant change in our environment, processes are outdated the immediately after they are designed. The 90s business process re-engineering model intended to introduce change, but was driven by experts which simply delivered another set of frozen processes. Because participants in process are not considered experts in theory, they are empowered to make decisions on their own when something fails. John Seely Brown and John Hagel point out that while 95% of IT investment goes to support business process (to drive down costs), most employee time isn't spent on process -- but exceptions to process. Further, competitive advantage comes from how we innovate in handling exceptions. When something fails, informed and empowered employees turn to their social network. The informal network, or heterarchy, where most business gets done. Today, some staid corporations are abandoning process all together (I wish I could quote the source for this). Google is a more public example, albeit an exceptionally new large enterprise, where wikis and weblogs enable a culture of working openly in a flatter and decentralized organization. This is data point helps plot the trend of decentralized organizations that realize economies of scale, as described by Thomas Malone in his book, Decentralization. Assume for a moment that the 25% of GDP that is search costs falls. Or the 50% of GDP that is transaction costs similarly declines. Coordination costs fall with rising connectivity. The cost of personal publishing and easy group forming are rapidly falling to zero. If a knowledge worker has relevant information at their finger tips, can form the right group to handle an exception, leverage the social context of information and contribute to memory as a natural by-product of getting work done -- what is the role of process? A process is like a standard. It provides a common definition for others to build upon. This is generally a good thing. In technical systems it helps resolve complexity so higher order abstractions can keep things simple. But even in technical systems, efficiency comes at a cost of adaptation. In social systems, especially where not everyone helps design what they participate in, the constraints against adaptation are compounded. At best, a process should serve as a reference model. Something that others can reference when completing a task. Something that can be leveraged for innovation, a boundary condition for experimentation at the margin. 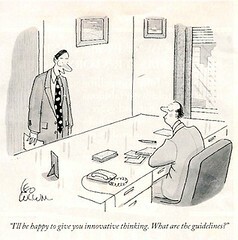 As with many things, gaining greater participation and innovation requires sharing control. I do not believe we are near the End of Process, yet. I do believe the arguments for engineering organizations are being trumped by new practices and simple tools. The first organizations bringing it to an end will have a decided competitive advantage. UPDATE: Comments are starting to get interesting. Euan Semple nails it: Process is the sort of word that grown ups in suits use to throw their weight around and to convince others that they know what is going on and that it makes sense.